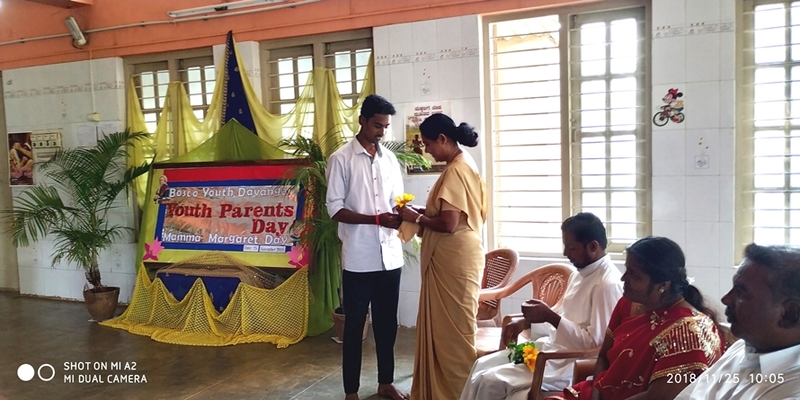 As directed by the regional office of Don Bosco Services Bangalore, Don Bosco Child Labour Mission Davangere too organized a parents’ day of the youth on November 25, 2018 in commemoration of Mamma Margaret, mother of Don Bosco. There were about 25 parents and as many youth present for the programme. Mr Manjanaik welcomed the whole gathering. Fr Dominic Kristuraj Sdb, Vice Rector and Director of Don Bosco Alurhatti was the chief guest of the occasion. In his message he reminded the youth that it is not their money that the parents expect from them but their discipline and well behaved life. Each one must become good and honest citizen. Mr Chethan M D’Souza, the lay animator of the group gave a small introduction to the gathering explaining why such a meeting was held. The most important part of the programme was the sharing session by the youth about their parents. Everyone had quite sweet and memorable things to share with the gathering. Sr Kuttiyamma , Adorers Convent, Davangere, Mr Manjanaik, a youth leader, Mr Robert and Mrs Mary, representatives from the parents were present at the dais. There were also different cultural programmes by the youth. The programme ended with vote of thanks by Ms Mary.